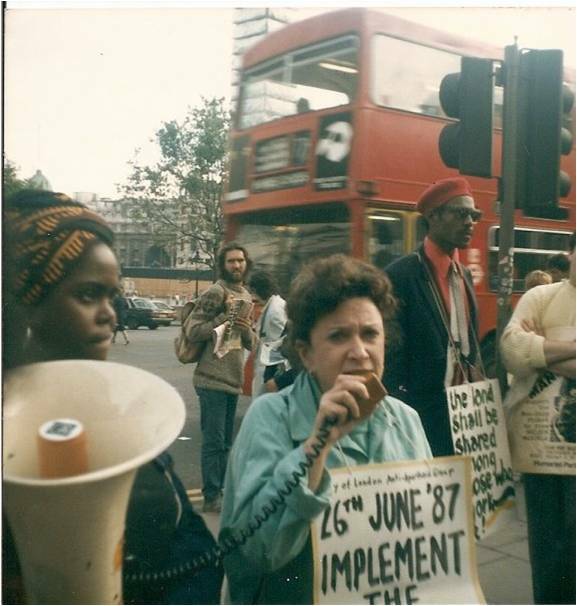 From 1986 – 1990 the supporters of the City of London Anti-Apartheid Group [City Group] maintained a Non-Stop Picket outside the South African Embassy in Trafalgar Square calling for the release of Nelson Mandela. City Group was formed by Norma Kitson (an exiled ANC member), her children, friends and supporters (including, crucially, members of the Revolutionary Communist Group) in 1982. City Group’s unconditional solidarity with all liberation movements in South Africa and Namibia (not just the ANC and SWAPO, but also the Pan-Africanist Congress and AZAPO amongst others) and its principled linking of the struggle against apartheid with anti-racism in Britain led to group’s eventual expulsion from the national Anti-Apartheid Movement. City Group deployed diverse tactics, including direct action, to express its solidarity with those opposed to apartheid. Its support for those sidelined by the exiled leadership of the ANC was valued by activists in South Africa. The Picket played a key role as a ‘convergence space’ through which transnational activist discourses and practices addressing the politics of race were articulated. As such, an analysis of its political culture is important and overdue. The Picket was a highly visible protest against apartheid. Through its constant presence, the Picket developed a distinctive appearance, culture and sense of community. Bright hand-sewn banners (often in black, green and gold, the colours of the ANC) provided a backdrop to the Picket, declaring its raison d’etre and picketers carried placards which declared their solidarity and commented on topical events and campaigns in South Africa. Members of the picket would leaflet and petition passers-by, whilst others made impromptu speeches on a megaphone or sang South African freedom songs. Larger themed rallies were held on Friday evenings, and on Thursdays the Picket’s numbers swelled as supporters danced to the music of a group of street musicians, the Horns of Jericho. The culture of the Picket not only conveyed its political message of solidarity, but helped individual participants define their personal identities. Positioned on the pavement directly outside South Africa House, the picket was strategically placed to draw attention to apartheid and bring pressure to bear on the regime’s representatives and allies in the UK. The Embassy repeatedly brought pressure on the British Government to ban the protest, and for nearly two months in 1987 (6th May – 2nd July), the Picket was removed from outside the Embassy by the Metropolitan Police (following an action in which three City Group activists threw several gallons of red paint over the entrance to the Embassy). During this period, the Picket relocated to the steps of nearby St. Martin-in-the-Fields Church and activists repeatedly risked arrest to break the police ban on their protest and defend the right to protest outside the Embassy. The police used an arcane Victorian bylaw, “Commissioner’s Directions”, which allowed the Metropolitan Police Commissioner to curtail public gatherings within a mile of Parliament, to allow MPs free movement to go about their business, to ban the Picket during this period. Eventually, the ban was broken when four MPs protested outside the Embassy alongside other picketers and the police were unable to justify the ban any longer. In total 173 people were arrested during City Group’s campaign to break the police ban and defend the right to protest. All charges were eventually thrown out of court. City Group’s activism was not restricted to Trafalgar Square: picketers took direct action against apartheid across the UK and toured the country mobilising solidarity. These extended campaigns of direct action away from the Non- Stop Picket included ‘trolley protests’ against the sale of South African goods in supermarkets across London, where activists filled trolleys with South African produce, took them to the checkout and then refused to pay for them. At their most effective, these protests could tie up the majority of checkouts in a targeted supermarket simultaneously. In a similar vein, City Group organised frequent occupations of the South African Airways (SAA) offices in Oxford Circus through their “No Rights? No Flights!” campaign. These offices were frequently closed through successive occupations several times in a day. As the security staff at the SAA offices increasingly recognised protestors, activists needed to utilise more and more imaginative disguises to enable their initial access to the premises – during one women-only protest on South African Women’s Day in 1988 a large party of women, varying in age from their mid-teens to their seventies, occupied the SAA offices dressed as nuns and a class of convent girls. Finally, City Group activists took direct action at sporting venues around the UK, including pitch invasions at various athletics tracks and cricket grounds, in protest at sportsmen and women who had broken the sports boycott of South Africa. The geography of the Non-Stop Picket extended beyond its location and its relationship with the struggle in South Africa. The combination of the Picket’s central location and its expression of solidarity through confrontation with the representatives of apartheid attracted a broad and diverse group of (mostly) young activists from the UK and beyond. The Picket provided ‘uncommon ground’ through which friendship networks developed that crossed boundaries of nationality, ethnicity and social difference. At times, the Picket became something of a haven for young street homeless people living in the West End, although their involvement was often shortlived and marked by the reassertion of social hierarchies by more settled and privileged members of the Picket. The social and political life of the Picket had a particular emotional geography through which individuals overcame social isolation, transformed their sense of self, and enjoyed being ‘unruly’ in public space. These entangled personal and political motivations are crucial to a holistic analysis of the Non-Stop Picket and transnational solidarity activism more broadly. This entry was posted in Uncategorized and tagged ANC, Anti-Apartheid Movement, AZAPO, City of London Anti-Apartheid Group, Direct Action, Geography, Non-Stop Picket, Norma Kitson, PAC. Bookmark the permalink. Although City AA had lots of protests for SA Women’s Day, Namibian Women’s Day etc, and these were led by women and focussed on women’s contribution to the freedom struggle in South Africa, we specifically didn’t have ‘women only’ protests and men were always welcome and involved. Nicki – this is definitely one to check on. My recollection is that on this particular action only women entered the SAA offices. I suspect you are right and there were men outside supporting the action in various ways. Or, was this the occasion Mike Burgess dressed as a priest? Actually, you know we didn’t go in dressed as nuns, but as a school teacher and some of her pupils. It was indeed a women’s only occupation. Mike B dressed as a priest during a different occupation of SAA. Can’t wait to read more of this, it’s looking very good. Thanks for bringing it all back, this is a beautiful article. Yes I was one of those whose life was completely changed by the City of London Anti-Apartheid Picket. I hadn’t realized until now how much. Thanks again.